Penn State football has been playing for just over 130 seasons and, to The Centre Daily Times’ knowledge, a large group has never before been assembled to pick out the all-time stars in the Nittany Lions’ storied history. The Centre Daily Times thought this Happy Valley summer was the perfect time to change that. So, they organized a group of 12 experts — six former players and six media members, all listed below — to vote on the top 10 all-time players at each position. Like any list it may not be perfect, but it’s the closest thing to an expert consensus that’s been done so far. The Centre Daily Times kicks it off with running backs and will release another position each following day. If you think they missed something, The Centre Daily Times has good news for you: You can vote yourself in their fan poll, and they’ll release those results on July 22. RELATED: Can Trace McSorley become the greatest QB in Penn State history? Joe Paterno once said he was “probably the best player I coached, all-around” — and Moore received a top 10 vote from every single one of our panel members. He narrowly missed out on being ranked as high as No. 6. He wasn’t a fan of catching passes in Happy Valley, but it became The Reading Rocket’s bread-and-butter during his Hall of Fame playing career in the NFL. He never had the best offensive line. But whether it was a run, a catch — even a pass — he never struggled in showcasing his best. 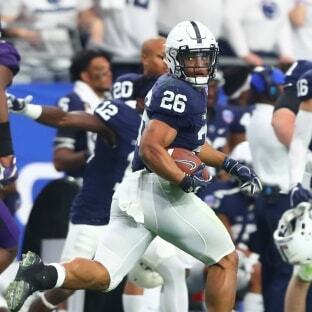 Said coach James Franklin: “I’ve been blessed to coach him.” And, as the greatest running back in Penn State history, fans were blessed to watch him. This article is written by Josh Moyer And John McGonigal from Centre Daily Times and was legally licensed via the Tribune Content Agency through the NewsCred publisher network. Please direct all licensing questions to legal@newscred.com.